Location: Salle Serge Reggiani, Avenue des Canadiens, 76470 Le Tréport, France. 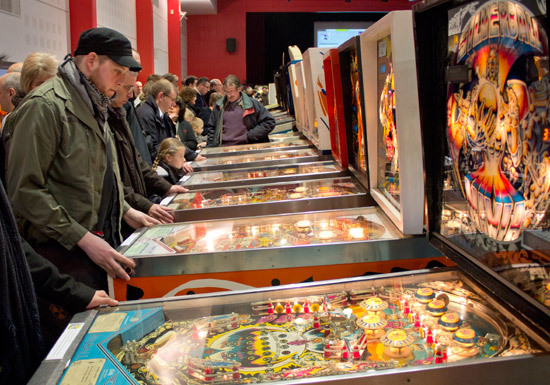 The French coastal town of Le Tréport is home to the annual Flip-Expo pinball show. 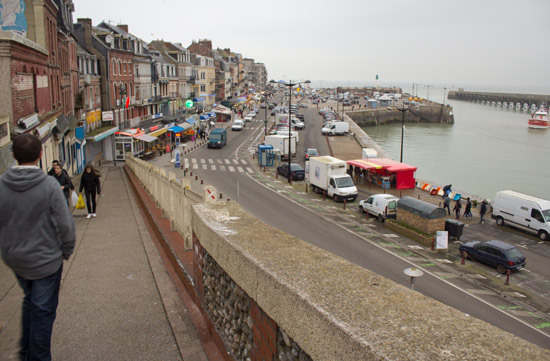 Le Tréport is located on France's northern coast, about 30km from Dieppe, and is fairly easily reached from the UK and the Benelux countries. There is a ferry from Newhaven in the UK to Dieppe and it's only about 90 minutes' drive to the larger port at Calais. 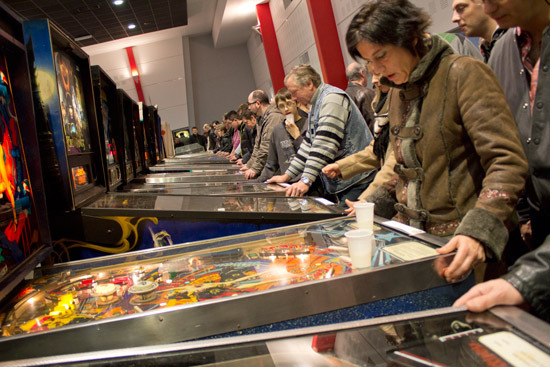 This year's show was extra busy because the French show usually held each year at Vierzon will not be taking place this year, leaving Flip Expo as the main pinball show in the area. It also received promotion in the media and on posters around the town. 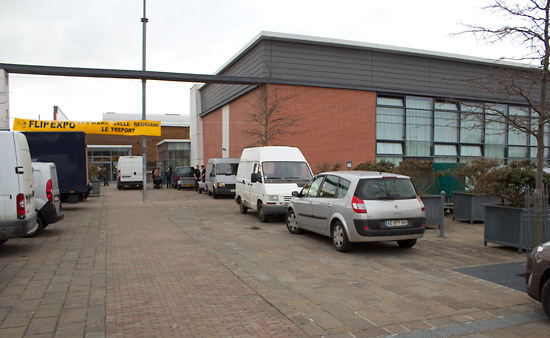 But we have to go a little inland to reach the Salle Serge Reggiani, which is a modern municipal hall with good car parking facilities and a supermarket next door. 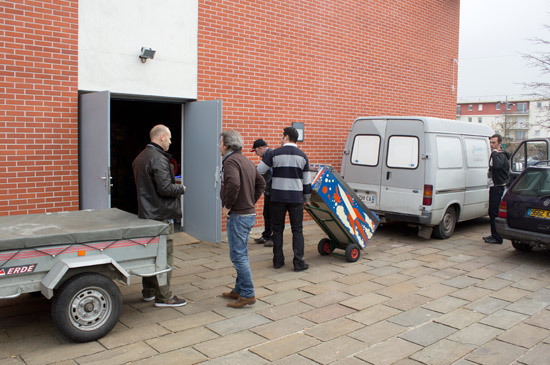 Unfortunately, the supermarket was being refurbished during the show, so getting any supplies involved a slightly longer walk or a short car journey. 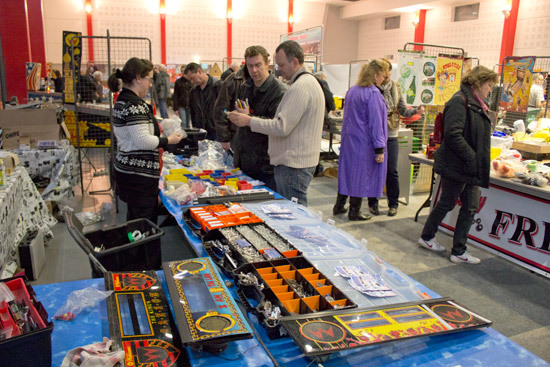 Games and stalls were set up throughout Friday and continued to arrive on Saturday morning. 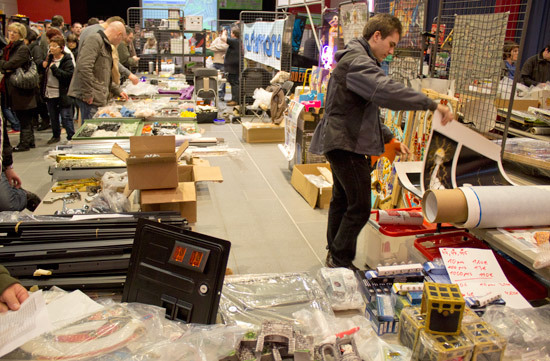 Flip-Expo opened to the public at 10am on Saturday, by which time a fair-sized queue had built up. 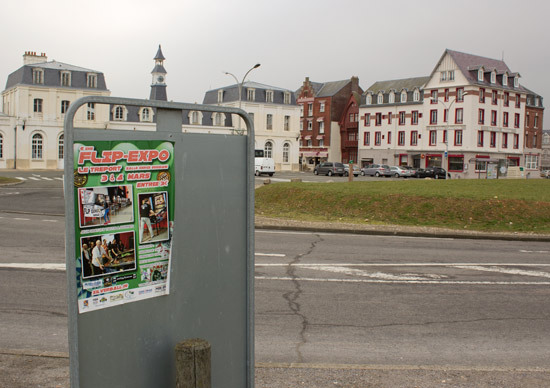 Entry to Flip-Expo cost just €3 ($4, £2.50) per day, or €5 for both days. 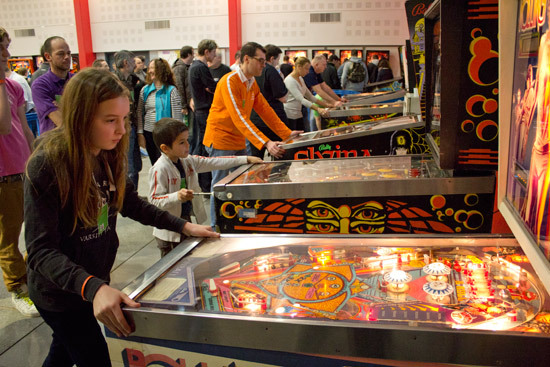 Inside, visitors found a large number of vendor stalls and more than 60 pinball machines set up. 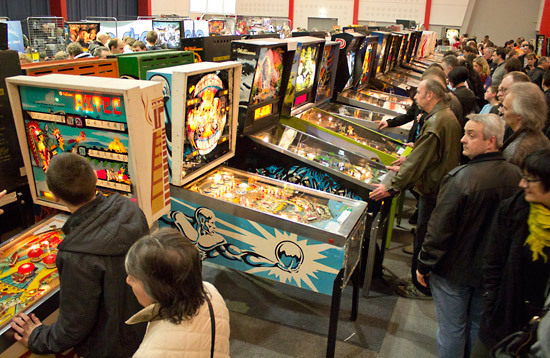 Most of the free-play machines were arranged in two long back-to-back rows on the right of the picture above, with vendors in the centre and on the left. A row of blue barriers separated the main hall from the tournament area. 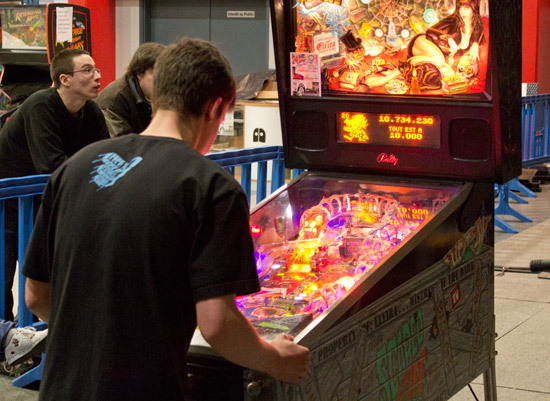 The condition of the machines varied from working fine to unplayable. Many were brought to sell and a few of these were unfortunately not set on free-play, so you had to find the owner and get credits added if you wanted to try them. There was a good mix of EMs, early solid-state and DMD games. 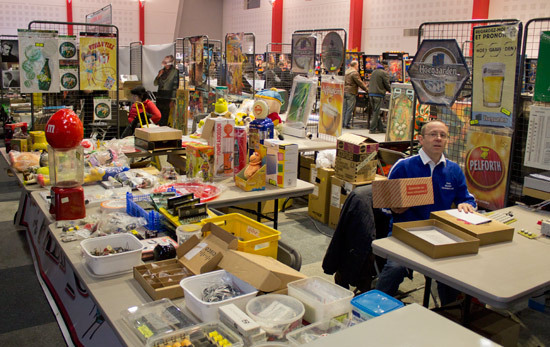 France has always been a big market for Gottlieb/Premier games, so it was no surprise to see some of these represented, including machines not so commonly found at shows outside the country, such as Diamond Lady, Amazon Hunt II and Magnotron. There were busy times on both days when it was impossible to find any vacant machines and the areas around them became very crowded. But at other times the crowds would vanish, and suddenly it became a lot easier to move around. 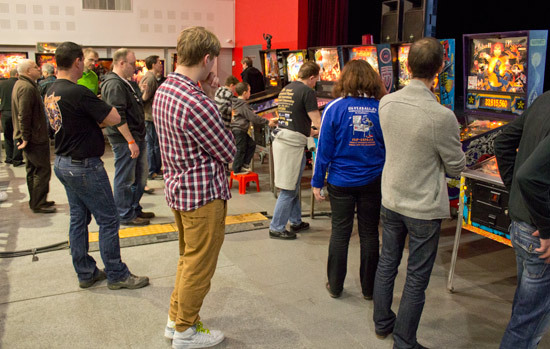 Here's the full list of the 62 machines in the free-play area on Saturday. 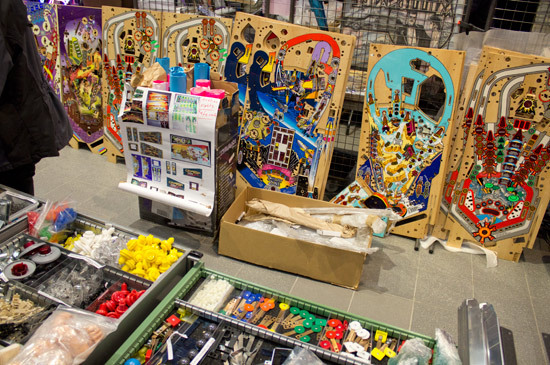 In addition, there were a number of machines on vendors' stands, most of which were either not switched on or not accessible for the public to play. 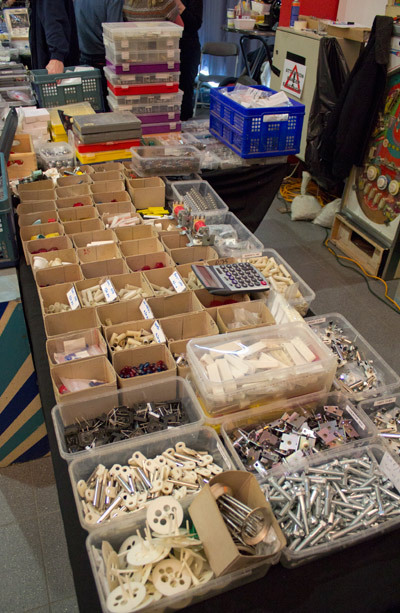 The vendors take up the majority of the hall and were selling a large range of pinball and general games parts. 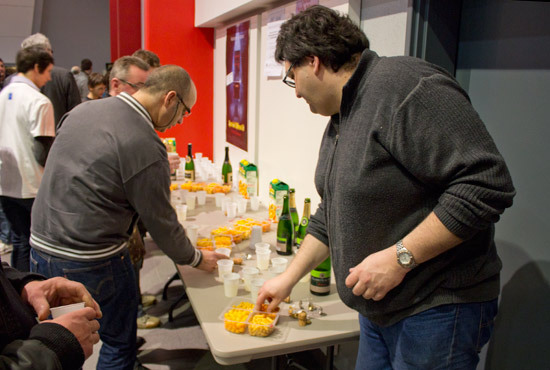 Shortly after the show opened, everyone was invited to enjoy a free cup of light sparking wine and nibble on some corn snacks. For those wanting something more substantial, there was a desk selling hot and cold drinks, beer, cakes, crepes and baguettes. The prices were all very reasonable with bottles of water €1, beers €2 and baguettes €3. 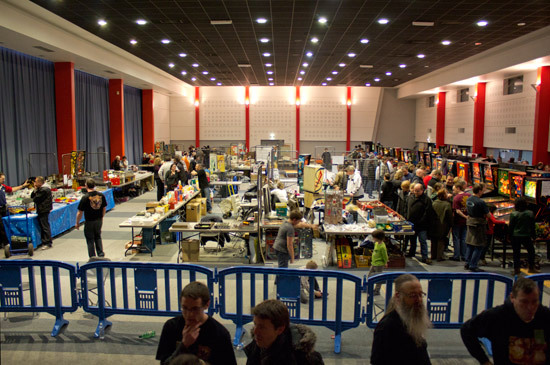 At the far end of the hall, behind a set of blue plastic barriers, were the 17 machines reserved for the main tournament on Saturday. 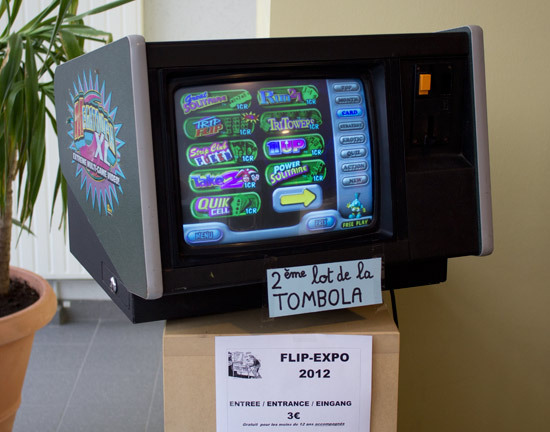 This was organised by the LNJF (Ligue Nationale des Joueurs de Flipper) and attracted 100 pre-registered players, each paying €15 to enter. 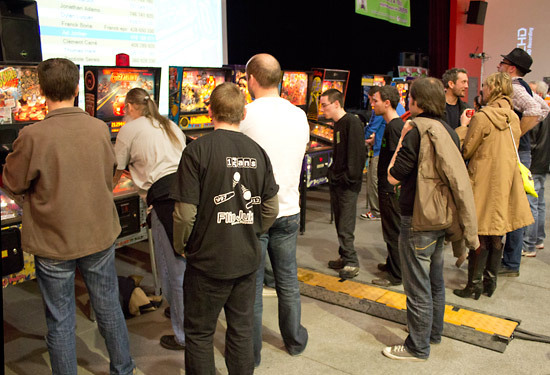 Behind the main row of machines was the hall's stage, at the back of which a large projector screen showed the current standing and machine scores. 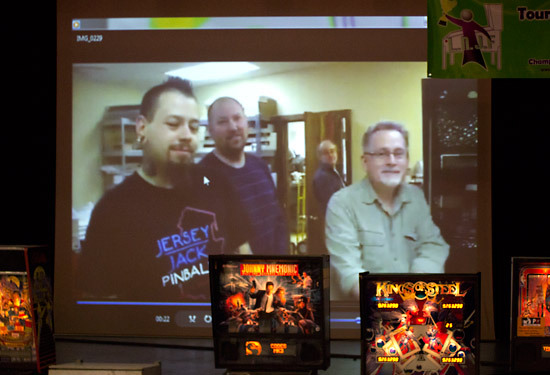 Before the tournament began, the projector screen was used to display a pre-recorded video message from Jack Guarnieri who was behind the camera as he showed us the Jersey Jack Pinball team working on The Wizard of Oz. Jack had hoped to be the special guest at Flip-Expo but with The Wizard of Oz now nearing production, he was unable to attend and so sent this video message instead. 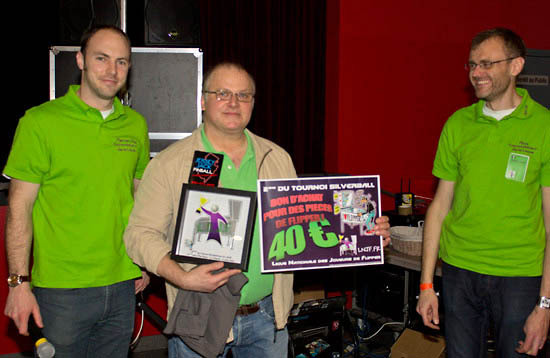 He also sent a number of prizes for the tournaments. 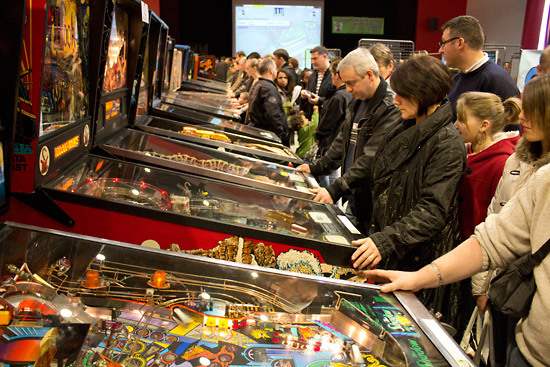 When the tournament began at 10:30am, competitors could choose any 5 of the 17 machines on which to qualify. 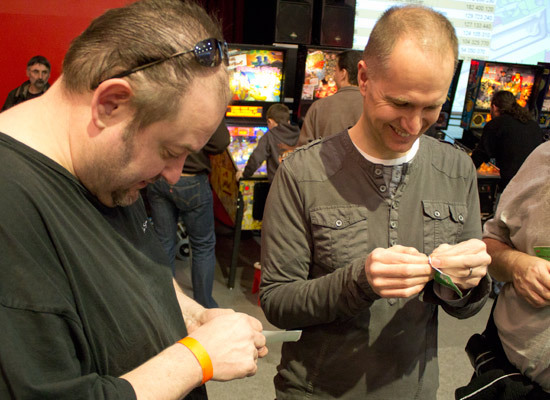 Before that though, the first challenge of the day was removing the paper backing from the tournament's name badges. 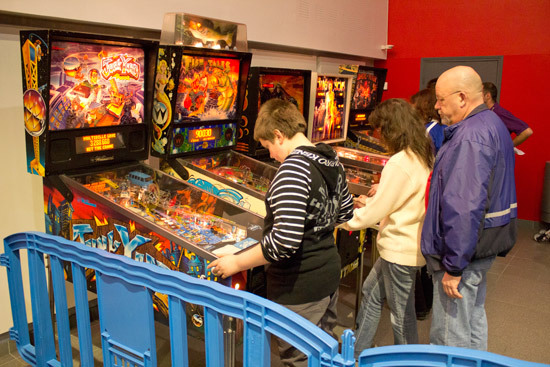 All the scores on each machine were ranked, with 100 points for the top score. The 32 competitors with the highest ranking points across their five games went through to the play-off rounds. 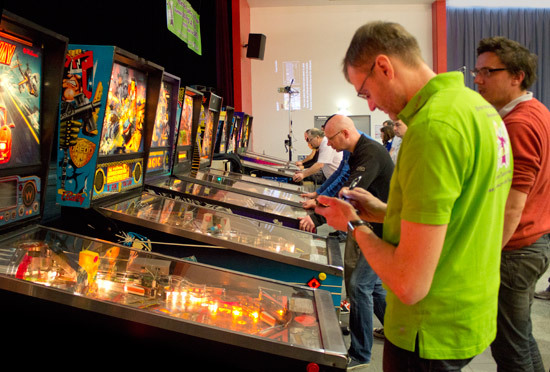 After a quiet start, competitors soon began to play their qualifying games and the area filled up both with players, and with those looking for clues about how the machines played and where to shoot for maximum points. 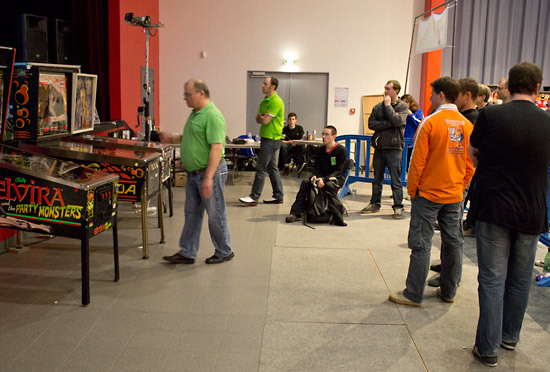 Scores were recorded on PDAs with the projector screen alternating between individual machine scores and overall rankings. Despite having one hundred players, everyone had completed their five qualifying games about 30 minutes before the scheduled close of qualifying at 4:30pm. The first play-off round consisted of 16 2-player matches which were best-of-three single elimination. Qualifiers 1-16 were matched up with qualifiers 17-32, such that the top qualifier played the 17th qualifier. 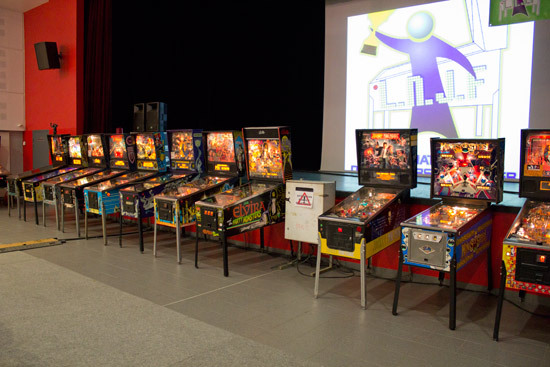 The higher qualifier had choice of playposition throughout and could choose the first and (if needed) third machines to play. The lower qualifier just got to choose the second machine. The 16 winners from the first round then played another similar round to reduce the number of players from 16 to 8. Another elimination round produced the final four who were; Peter Blakemore, Franck Bona, Alain Boulieu and David Grémillet. 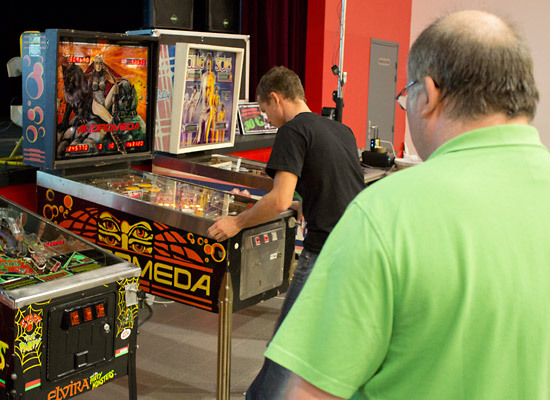 The machine drawn for the final was Scared Stiff and it was Peter who played first followed by Alain, then came Franck, and David was player four. 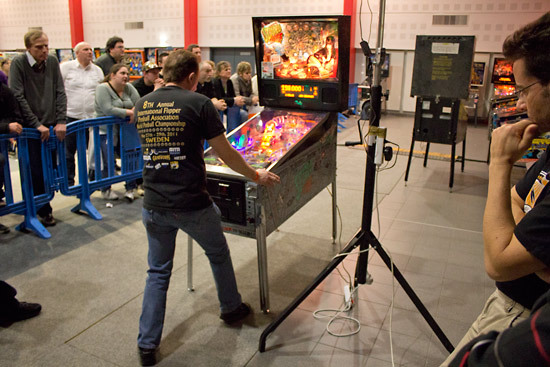 A video camera was mounted over the playfield so the audience could see the proceedings on the projector screen. After the end of everyone's first ball, David had a handsome lead with a score of 10,458,250, more than double Alain's second place score of 5,095,900. Franck was in third with 4,451,060 with Peter fourth on 1,505,930. The second ball saw Peter recover to go into the last ball with score of 9.4M, compared to Alain's 6.8M and Franck's 6.1M. But David didn't boost his score by much, ending his ball two on 10.6M. It was still anyone's game as the third and final balls were played. Peter improved his score slightly to 11,747,220, giving him a slender lead. Alain soon took over that lead with his score-doubling third ball, ending on 13,545,280. Franck's attempts to stage one of his classic comebacks was frustrated with an early drain to end on 7,031,580. Which left David, who just needed to score a further 2 million points to take first place. 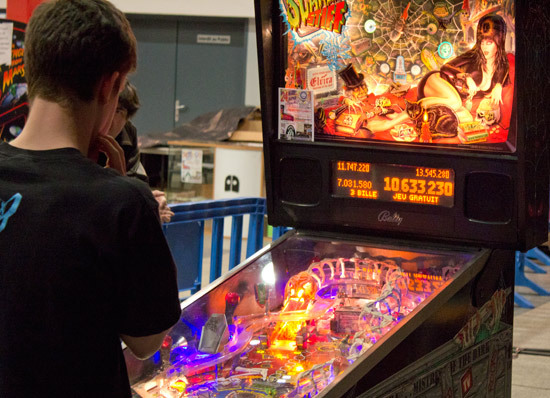 With Crate Multiball ready to go, David started Boogie Man Boogie mode before shooting the crate, ensuring each crate jackpot also boosted each switch's score by 5K. It wasn't long before David surpassed Alain's score, and had won the final. Shortly afterwards, the awards ceremony took place. The tournament had run to the very end of the show, so much so that the lights had been turned off by the time the final awards were handed out. The best young player ('Potential Champion') award went to Florimont Boete. 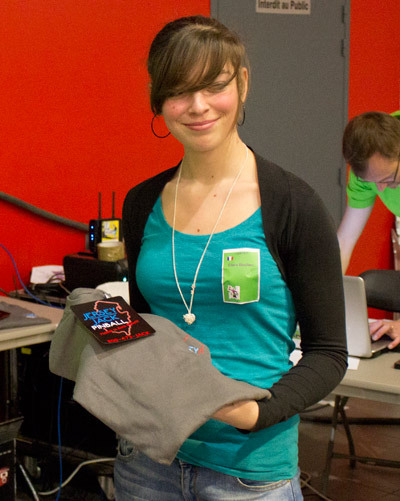 The top women player in the tournament was Laurence Boulieu. In fourth place was Franck Bona. 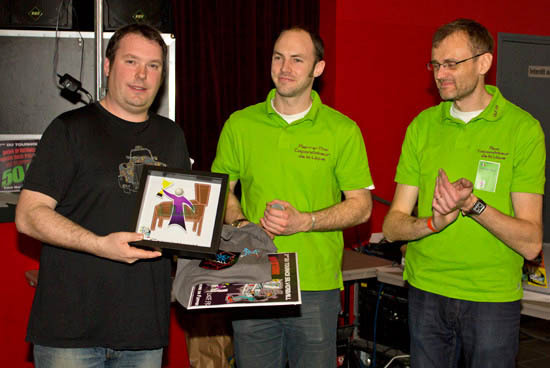 Franck won a Jersey Jack Pinball T-shirt and a framed trophy. Third was Peter Blakemore who took back to the UK a T-shirt from the LNJF, a framed trophy and a Stern Pinball Wheel of Fortune translite. 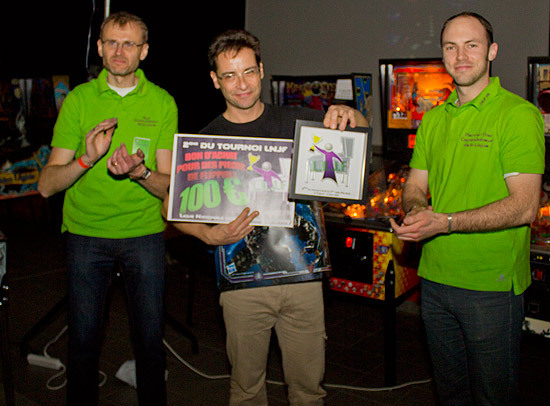 The runner-up was Alain Boulieu who won a framed trophy, a Stern Pinball Transformers Pro translite and a certificate for €100 of pinball parts. And the winner was David Grémillet. David won an AC/DC Pro translite, a framed L.N.J.F. trophy and a certificate valid for a sheet of anti-glare glass worth €160. Here are the full results for Saturday's tournament. 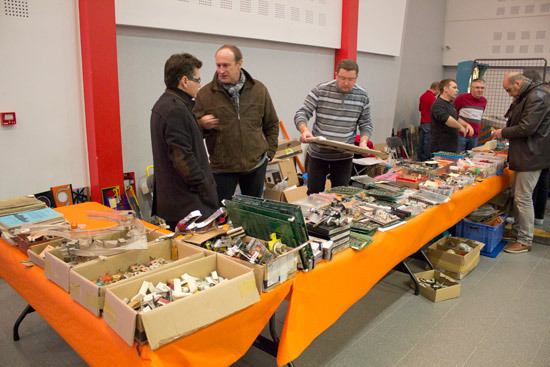 On Sunday, the show again opened at 10am and there was a new tournament in which to compete. 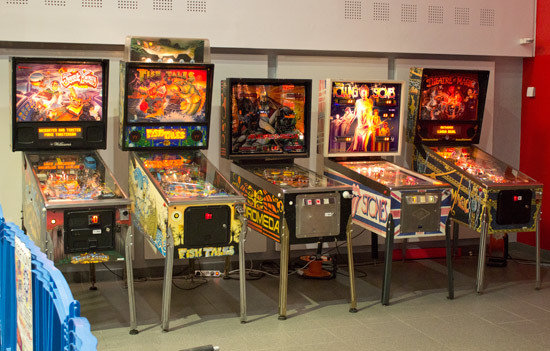 The machines had been re-arranged and now six 'classics' games occupied the tournament area. They were; Spirit of '76, Whirlwind, Buck Rogers, Elvira & the Party Monsters, Andromeda and Rolling Stones. 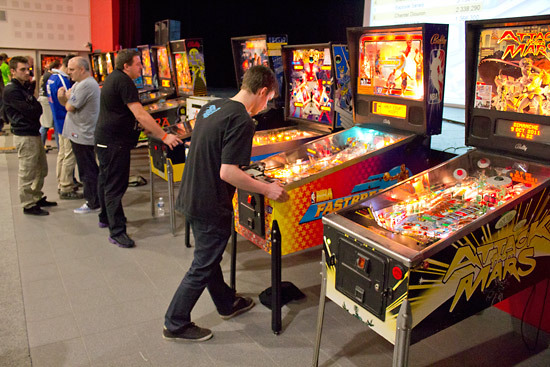 The format was much like Saturday's play-offs, where single-elimination, best-of-three matches were played with players randomly-paired and playing on randomly-chosen machines. After the first round, 32 competitors remained. These were then paired-up and pared-down, first to 16, and then to 8 for the semi-finals. 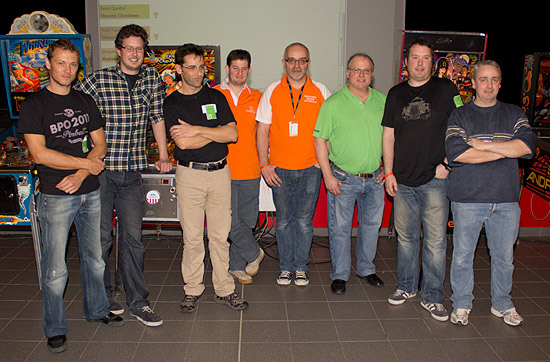 Those 8 were; Will Barber, Laurent Blin, Alain Boulieu, Loïc Grébonval, Fabrice Lefévre, Christophe Magniez, Vincent Ratier and Jérémy Reynaud. 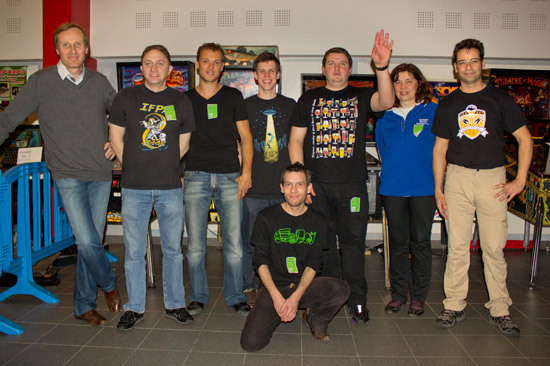 These eight were then whittled down to the final four who played out the final game on Ad Jonker's Andromeda machine. 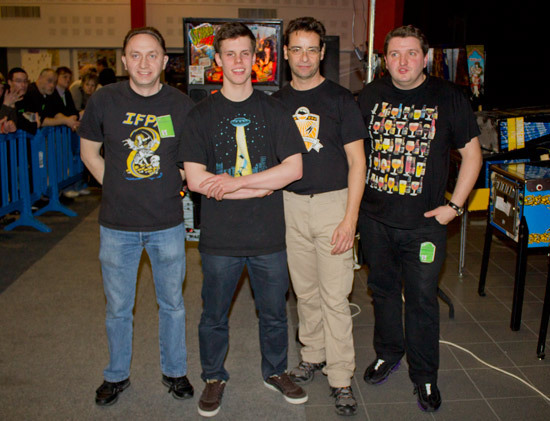 Fabrice took the player one position, Loïc was second to play, Jérémy was third and Will was player four. Loïc never got much of a chance to play, as the game rapidly drained his three balls for a total of 92,530 and fourth place. Will did a little better, going into his final ball with 163,120 and ending on 222,990. But that wasn't enough to beat either Fabrice or Jérémy, putting him in third place. After ending ball two on 121,460, Fabrice had a better third ball and boosted his end-of-game total up to 309,690, putting him in the lead. Jérémy had a score of 242,460 going into his final ball, needing another 67,230 to reach Fabrice's score. Could he do it? In the end, Jérémy had no problem taking the lead and winning the final with a great score of 1,031,280. The awards were then given out to bring Sunday's Classic Tournament to a close. 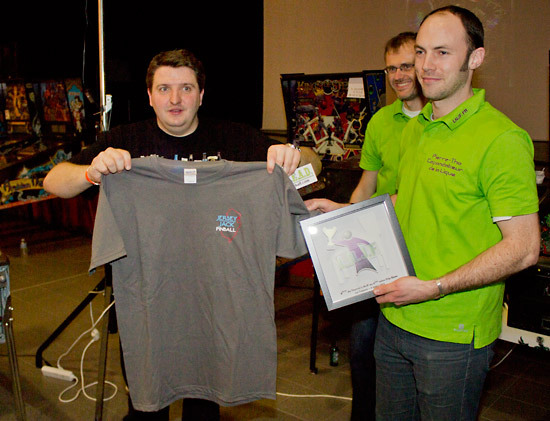 In fourth place was Loïc Grébonval who won a framed trophy and a Jersey Jack Pinball T-shirt. 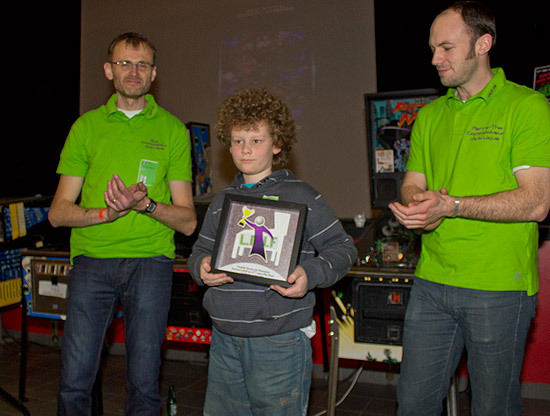 In third place was Will Barber who also won a trophy and Jersey Jack Pinball T-shirt, but also took home a €30 pinball parts certificate. 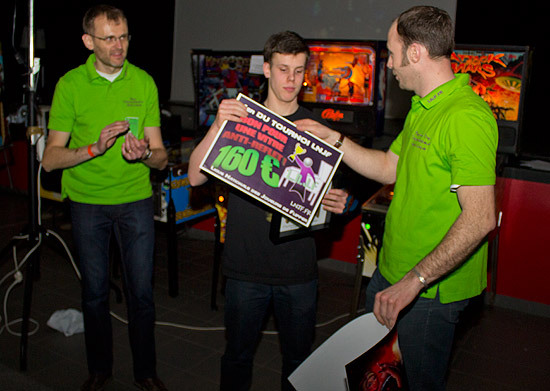 The runner-up was Fabrice Lefévre and he also received a trophy and T-shirt, but his certificate was for €40 worth of pinball parts from the LNJF. 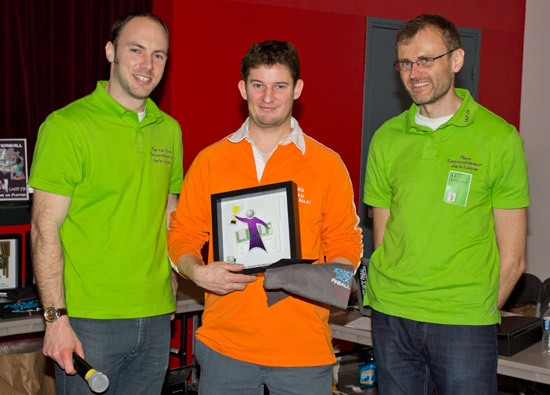 Finally, the winner of Sunday's Classic Tournament was Jérémy Reynaud. 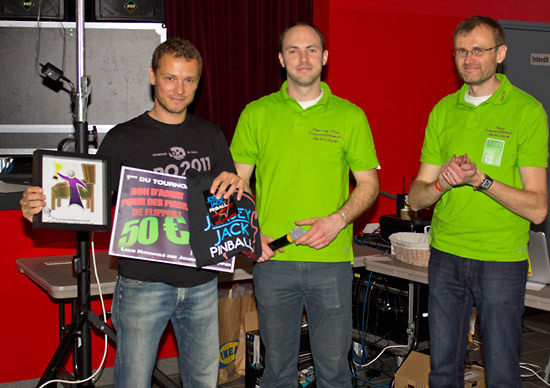 He won the same prize pack as Fabrice and Will, but with a €50 parts certificate. 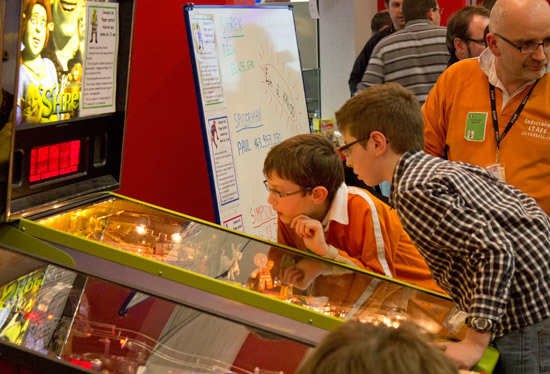 These two tournaments weren't the only competitive events taking place at Flip-Expo, because there were also three Kids High Score Competitions held near the entrance to the hall. 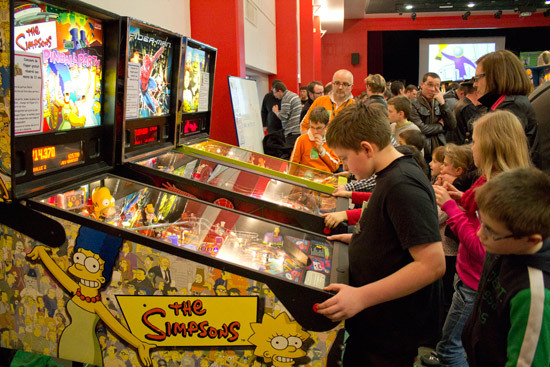 Each of the three machines - The Simpsons Pinball Party, Spider-Man and Shrek - hosted its own High Score Competition, with the highest scorers when the competitions closed at 5pm being declared the winners. 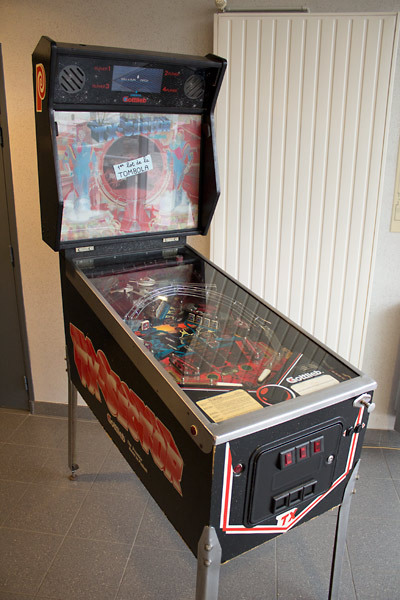 For those who were feeling lucky, there was also a raffle held with the top prize being a Gottlieb TX-Sector pinball. 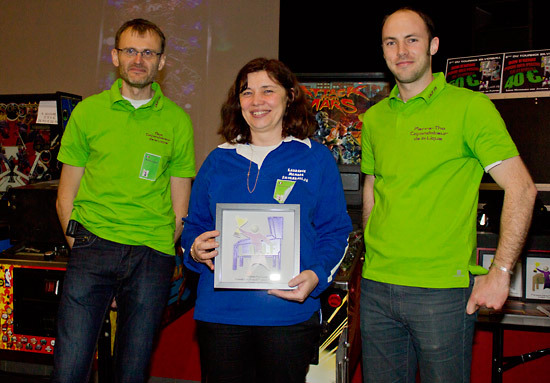 Second prize as a MegatouchXL games unit. Unfortunately we had to leave to catch the ferry home before the raffle took place, so don't know who won, but apparently it wasn't us. Next time we'll try buying a ticket first. 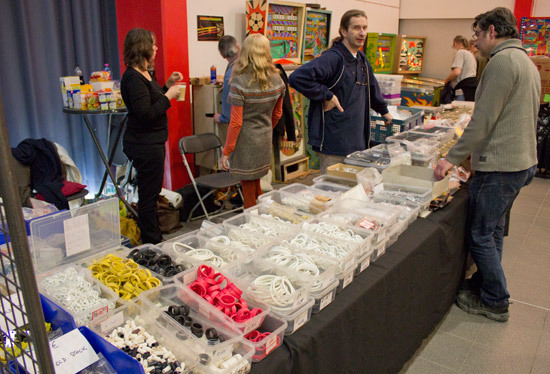 We'll end this report with our unique Four Minute Tour - a video walk around Flip-Expo 2012 on Sunday afternoon, letting you experience the games, the vendors, the people and the sounds.